When most European and North American capitals have roundly condemned the politically motivated persecution of former prime minster Yulia Tymoshenko by president Yanukovych of Ukraine, Viktor Yushchenko, in his WSJ opinion piece "Ukraine's Democracy Hasn't Come Of Age" cannot find one good word for the woman without whose support during the Orange Revolution he would certainly never have become president. Even though international observers had adjudged the 2004 presidential elections to be fraudulent, he was ready to 'throw in the towel'. It was Tymoshenko who rallied demonstrators in Kyiv's Independence Square until the elections were re-run and Yushchenko finally elected into office. The EU clearly recognise the current roll-back of democracy in Ukraine - and they have had enough of Ukrainian leaders' geopolitical playing off of Europe against Russia. Yushchenko claims: "..democracy and the rule of law have not yet come of age [in Ukraine]. They remain fragile; the gains of the Orange Revolution could still be reversed." The gains of the Orange Revolution have been reversed 'big time' in the two and one half years of Yanukovych's presidency - Yushchenko should hang his head in shame. Today in Kharkiv a Radio Liberty correspondent asked president Yanukovych a question. He suggested the recently-passed controversial language law was divisive, and wanted the President to explain why he spoke only in Russian when he inaugurated a new Ukrainian Independence monument earlier in the day in the city. A visibly annoyed president replied:"I always speak in any region in the language of the people who live there. And it is those who make such suggestions and raise such questions without considering the point view of people who live in this land, who split Ukraine. I've always been a supporter of the view that there should be understanding in the state and harmony, regardless of which region people live. Financing, attitude towards people and social programs for all will be the same ... And you, young man.. hear this...and tell everyone else: We will never divide people according to who speaks what language and in which region they live. All people are the same". Ukrainian remains the sole state language. Yanukovych is the president of Ukraine. Many Ukrainians consider their country's independence was denied for centuries by the rulers of the Russian, and latterly the Soviet empire, and that their language and culture devalued or oppressed by them. Over the past two years nine highly-place officials from Yulia Tymoshenko's premiership period have been charged and prosecuted, but only the former PM and her Minister of Internal Affairs, Yuriy Lutsenko, are in prison. Tymoshenko is facing further serious tax evasion and other charges dating back from more than a decade and a half ago. Lutsenko was sentenced to 4 years imprisonment with confiscation of property for exceeding his authority, and was recently was given a sentence of 2 years confinement for allegedly approving unauthorised surveillance in the criminal investigation into the poisoning of Viktor Yushchenko. Former Acting Defense Minister Valeriy Ivashchenko had been sentenced to 5 years imprisonment last April for abusing his office but a couple of weeks ago the Court of Appeal suspended his sentence and released him from custody. Former Minister of Environment George Filipchuk was sentenced in April this year to 3 years imprisonment for abuse of power. However once Filipchuk gave back 1.4 million hryven to the state a Kyiv Appeal Court reduced his sentence to a 2 year suspended sentence. Former First Deputy Justice Minister Yevhen Korniychuk has been released from criminal liability under an amnesty the law. Korniychuk is son in law of former Chief Justice Vasyl Onopenko. Three senior officials were sentenced for illegally releasing 11 billion cubic meters of gas allegedly belonging RosUkrEnergo company. Former first deputy chairman of "Naftogaz Ukraine", Ihor Didenko, had been sentenced to three years in prison but prosecutors later reduced charges against him. Didenko decided not to appeal against the guilty verdict and he was released. Former head of the State Customs Committee Anatoly Makarenko received a 4 year suspended sentencence, as did the former head of the Kiev regional customs service, Taras Shepitko. They had been found guilty of illegal customs clearance of natural gas. The case against Makarenko and Didenko Shepitko was opened after Ukraine failed to defend its case in the Stockholm Arbitration Court where RosUkrEnergo won a lawsuit against Naftogaz. Naftogaz were ordered to return to RosUkrEnergo 11 billion cubic meters of gas and provide and extra 1.1 billion cubic meters of gas in damages for breach of contract. Former head of the State Inspection for Control of prices at the Ministry of Economy, Tetyana Rud was sentenced in November 2011 to 5 years for bribery However, a court later reduced this punishment to 3 years probation. The former head of State Reserve Committee Mykola Pozhyvanov, the former head of the State Treasury Tetyana Slyuz and former governor of Kharkiv, Arsen Avakov are currently being sought by law enforcement authorities. Avakov is in Italy. Former Economy Minister Bohdan Danylyshyn has been granted political asylum in the Czech Republic. I have just read, and can recommend, Masha Gessen's chillingly brilliant account describing Vladimir Putin's unlikely rise to power in Russia and how quickly he dismantled democracy in that country. Since becoming president two and a half years ago president Yanukovych has ploughed a similar furrow in Ukraine. There is already much to suggest October's Parliamentary elections will not be deemed fair by Western governments. One informed Polish journalist suggests: ".. [Ukraine] has been transformed into a country where elections are a playing field for manipulation, fraud, and total war.."
However, Presidential elections in March 2015 will be more difficult to steal, and if current trends continue the likelihood of Yanukovych being re-elected for a second term is not great. But any yielding of power to an opposition candidate is unthinkable - too many red lines have been crossed, the empire his family have built up recently would be smashed and, at best, they would be forced to flee. Vitaliy Portnikov, in an interesting article, suggests Yanukovych could be considering a solution to his dilemma - the creation of a new state, a kind of Ukrainian Transdnistria, with its capital in Donetsk, from where he could continue to rule. The recent upgrade in status of the Russian language [and the inevitable de-Ukrainianisation in this part of the country] could be a first step in this process. When operating hand-held power tools appropriate clothing should always be worn as loose-fitting clothing can be caught by moving parts. Safety glasses must be worn to protect eyes from flying, or splintering debris. Pussies strike fear into presidents.. 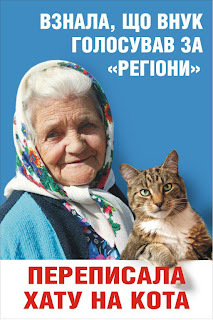 I love this story on how humour and pussies can outwit the greatest efforts of a mighty political machine...and not only in Russia..
A poster with an elderly lady holding a cat has caused controversy in Ukraine as preparations get under way for parliamentary elections due in October. The poster, put up in the east Ukraine city of Dniprodzerzhynsk, carried a humorous call not to vote for the ruling party. Next to the picture of the lady with the cat, a caption said: "I have learned that my grandson voted for the Party of Regions. So I have rewritten my will so that my cat inherits the house." Within a few days, the top part of the caption that mentioned the party had been removed, leaving the granny merely declaring that her house goes to the cat. Regional Governor Oleksandr Vilkul - also the local Party of Regions leader - had called the billboard's owners, demanding that "this outrage be dealt with", said a local news website. Dneprodzerzhynsk Online said that there was nothing illegal or offensive about the poster. "It is a shame, comrades, a shame," it said. "Lives in danger" A day later, the same website reported that the man behind the poster was Maksym Holosnoy, an opposition-minded head of a local village council. He told the website that the head of the billboard advertising company had been admitted to intensive care "following a telephone conversation with a high-ranking official". Holosnoy also told Dneprodzerzhynsk Online that he was wanted by the police, but it was not clear why. "It has been more than a month now and my lawyer cannot make it any clearer: we are not allowed to see any documents and we can't appeal," he said. "The example of our billboard is so telling. The Party of Regions has hundreds of billboards in our city alone, which it uses to proclaim that stability and prosperity have arrived. We only had one, which told the truth, albeit in a humorous way. Because of it, several people have suffered and their lives have been put in danger," Holosnoy said. Fatherland, a major opposition alliance in Ukraine, described police interest in Holosnoy as persecution and offered legal assistance to those who created and put up the poster. "The government's reaction to humour once again points to the dictatorial leanings of [President] Yanukovych and his entourage. Being unable to laugh at yourself shows that the authorities are immature, and that the Party of Regions leaders are beset by complexes and phobias," the alliance said on its Facebook page. However, Dnipropetrovsk police denied Holosnoy was being prosecuted for political reasons. He was wanted for embezzling state property when he was a local official, the police said. Meanwhile, in a YouTube video, Holosnoy said he was "being hounded" by the police because he is running as a candidate in the parliamentary elections. I have posted previously about kick-back deals involving hundreds of millions of dollars on the purchase via opaque off-shore companies, of deep sea drilling rigs to be used in the Black Sea . Now Halliburton, the world's second largest oilfield services company, is getting drawn into this corruption scandal. An letter from the company that was supposed to provide a fig-leaf to Ukraine's corrupt ministers and state gas company officials turns out to have less value than the paper it is written on. Journalists in the country have been heavily fined for posing with teddy bears in a photo session, while others are currently detained and could face years in prison for posting pictures of the teddy bears on the net. In Ukraine, crackpot deputy prosecutor general Renat Kuzmin says Yulia Tymoshenko is under investigation for assaulting a male prison guard and could face criminal charges. The slightly-built Tymoshenko has been suffering from a ruptured spinal disc for many months and is virtually bed-ridden. And a leading Ukrainian human rights spokesman, in his detailed analysis of Former Minister of the Interior Yuriy Lutsenko's current trial, says: "The court trial has vividly demonstrated that in our country absurdity is reality, and reality – absurd. If the [Ukrainian] legislation on investigative operations complied with the demands set out above of the European Court of Human Rights, this case would simply be impossible!" ..observing the swift "Belarusization" Ukraine, I want to warn those who think that none of this concerns them. It does concern them. The dragon will not be sated with just Tymoshenko or opposition members. And even journalists will not be enough. The dragon will eventually devour everyone. Woe to the people who feed the dragon. New parliament to be short-lived? They claim: "[October's parliamentary] polls (and the media climate in which they are held) must be fair enough to avoid sanction [from the West]. But they must also secure a majority for the ruling team in parliament." The V.R. 's lifespan depends on how long it will be amenable to the president's whims. Parliament has long ceased to be a place for political debate and decision-making, or for generating new ideas. Moreover it has long-ceased to be a self-contained branch of government, balancing out the cabinet of ministers and the presidential administration. It is no longer a place where the remnants of political competition can be maintained; as soon as Parliament tries to become what once was and what it is duty-bound to be, Yanukovych will dismiss it. He has the power to do so. All those standing for election and investing considerable sums to do so should be aware of this. and alteration the Constitution, to provide an opportunity for president Yanukovych to be re-elected for a second term in office by a vote in parliament rather than by popular mandate. Another reason for the fragility of the seventh convocation is economic.A sharp downturn in November and December is inevitable, because of the current global economic situation, and because of the big pre-election bugetary splurge currently being indulged in by the Ukrainian government. Yanukovych will deflect blame on PM Azarov, possibly sacking him and dissolving parliament. But everyone knows he has concentrated all authority in his own hands - it is he that will ultimately be held responsible. "The Ministry of Justice has concluded an agreement with the Skadden legal company to provide services in the field of legal investigation. According to the conditions of the agreement, lawyers of Skadden should conduct an investigation on the adherence to the principle of supremacy of the law and practices of the European Court of Human Rights in the case of "Tymoshenko vs Ukraine", which is [currently] being examined in the ECHR. According to the agreement, payment for services...cannot exceed 90,000 Hryven, [less than $12.000] hence tender procedures need not be applied..."
In other words, they are being employed to provide justification for Tymoshenko's persecution. Top Washington lawyers do not even get out of bed for this sort of money, never mind travelling abroad to conduct investigations in a distant foreign country. If the Ukrainian Ministry were serious they would earmark a sum of at least an order of magnitude greater. Skadden's 'fig-leaf' report will only be suitable for lavatorial purposes. Why on earth did they not employ a major Ukrainian law firm? It's all just a cheap PR stunt...and an embarrassment for Skadden. "Odessa's 7km bazaar has its own language of globalisation - The vast Ukrainian market operates as a law unto itself, with stallholders from all over the world dealing mostly in counterfeit goods of every description"
The country's customs service and their control of imports is a huge milch-cow for Ukraine's political/criminal clans. President Yanukovych has personally distributed the entire system of import among the three influential groups. The first of these is headed by Chairman of State Customs Service of Ukraine Ihor Kaletnik, the second by Yanukovych's grey cardinal, Yuriy Ivanyuschenko, [about whom I have blogged previously] and the third by former head of the State Security Service, now first vice-PM, Valeriy Khoroshkovsky. According to the respected 'Dzerkalo Tyzhnya' over half of the deputies in the last parliamentary convocation systematically truanted sittings. At one time or another over 90% of all deputies handed over their voting cards to other party members allowing anti-constitutional absentee voting to take place. Over 80% failed to provide proper income declarations. Over one half were allegedly linked to corrupt activities. Broadly speaking, Party of Regions' deputies were twice as culpable as those of BYuT. PoR recently published its list of election candidates for this autumn's parliamentary elections. It is a joke - packed with family members of the Donetsk clan. Many on the list have been in parliament previously but hardly ever attended any parliamentary session - their contribution virtually zero. Others only turned up when the party's leadership required their presence to physically 'rough up' or assault opposition deputies. Pledges by opposition parties that their deputies will do away with absentee voting and always attend pleniary sessions to vote in person will gain them many votes. p.s. I can recommend this London 'Daily Telegraph' article entitled: "President Vladimir Putin’s cruel tyranny is driven by paranoia". Putin is Yanukovych's role model - there are certainly many parallels.